Italian food for me is such comfort food. Pizza, pasta, cured meats and lots of cheese, accompanied by wine, I mean can you get much better? 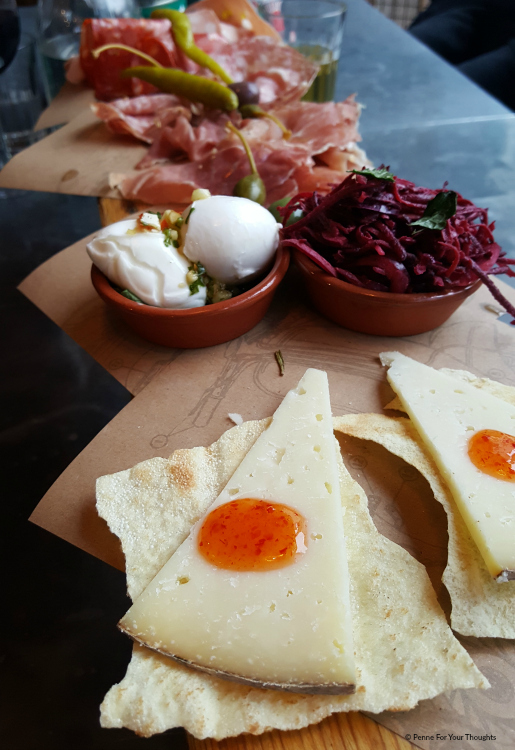 So when I was invited to go down to Jamie's Italian in Birmingham city centre, I said yes please and thank you. Chris in tow, we headed there for a late lunch after doing some Christmas shopping. As we were also meeting a friend for a curry later on that night we decided to share a starter and dessert. We still had to try all courses, for review purposes obviously. To start with we shared one of the Famous Planks, meat version. Filled with salami, mortadella, prosciutto & schiacciata piccante, mini buffalo mozzarella, pecorino & chilli jam, pickles, olives & purple slaw. As you can see, it's a great starter. I love picky bits that you can share with someone. 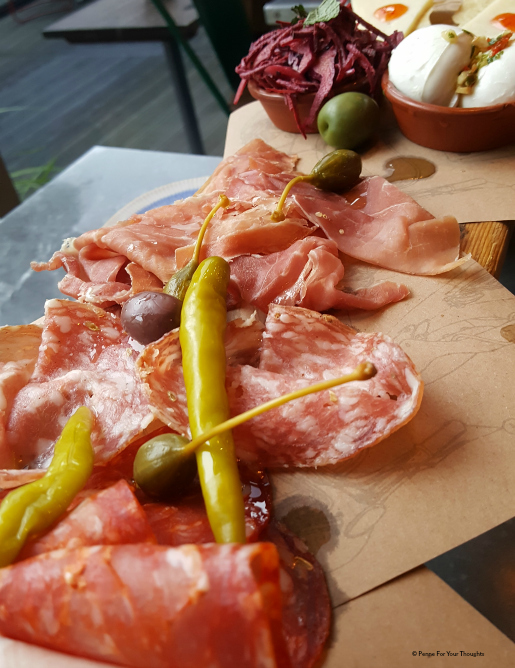 The meats were absolutely delicious, as was the chilli jam, the mozzarella was so creamy and the olives were some of the nicest I have ever had. 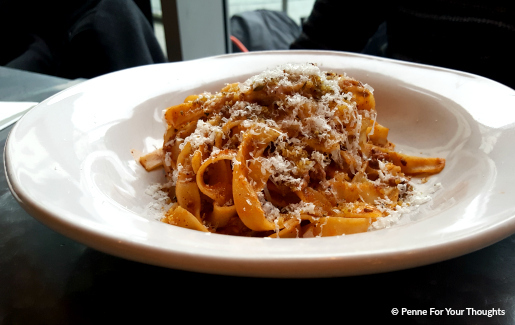 On to mains, Chris opted for his favourite pasta dish - Bolognese. This one was made from slow cooked pork and beef, and red wine. He loved it, and as I tried a mouthful, I can confirm it was great. I opted for the Oxtail Lasagne. It was a good move. Slow cooked oxtail, which was amazing! The flavours were just wonderful. My only wish was that the top of the lasagne was a little more crispy. Whilst we both opted for pasta for our mains, they also have a range of dishes on the menu including meat, fish, Jamie's burger and pizzas so there is something for everyone. They even do gluten free dishes and gluten free pasta. For dessert we shared the Molten Chocolate Praline Pudding. I am sad we had to share. It was delicious! Not too rich, which I often find with chocolate desserts, and the praline centre was yummy! It really oozed out. Overall we really enjoyed our food at Jamie's Italian. We had been before a few years ago and didn't think much of it, so hadn't been back. However, this new menu is great and has lots of varied choice. I'd definitely go back, and I think it would be a great place to go as a group of friends due to the large menu, great location (it's right next to the Birmingham Bullring) and relaxed atmosphere. For the three courses, a glass of wine and two beers the bill came to just under £60. 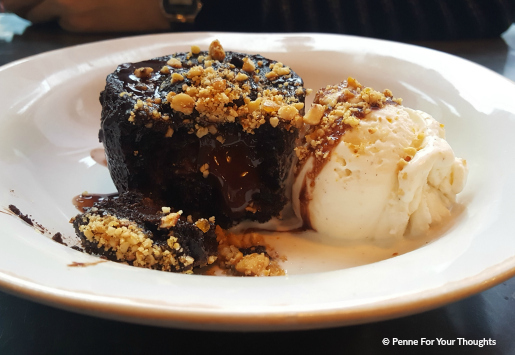 Disclaimer: We were given a £50 voucher to spend on the menu in exchange for a blog review. All opinions are my own and honest. 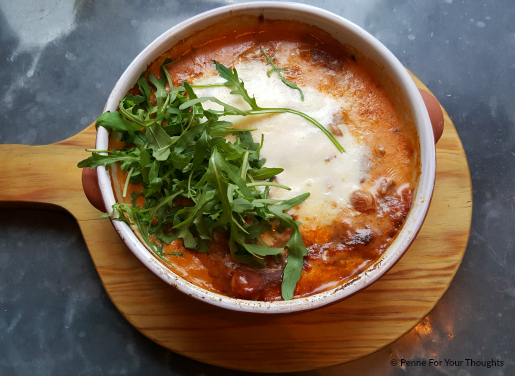 Jamie's Italian is one of my favourite restaurants in Birmingham. Would always recommend to anyone! I came across Rofuto http://rofuto.co.uk/japanese-restaurant/ recently too. Would be a great place to review!